As a piano technician, my concerns and expertise regarding the instrument are primarily focused on how they feel and how they sound. 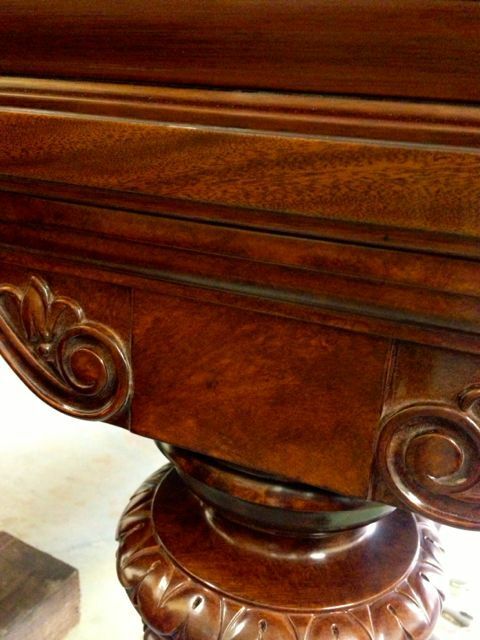 However, as an instrument that is also considered furniture and tends to draw the eye wherever it is placed, the condition of the case also tends to be a priority. To address such concerns, similar to how a mechanic would refer auto body work to a separate technician, the expertise of a master finish and/or touch-up specialist is required. 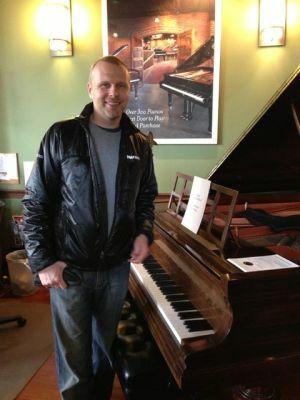 In Portland, OR, the go-to person for any of the cosmetic needs of a piano, whether they be small repairs to fix chips and scratches or complete refinishing jobs, is Arno Arrak. Originally from the Baltic nation of Estonia, Arno is an accomplished painter, a master screen printer, as well as a talented avant-garde musician. He decided to apply his extensive artistic background to pianos around ten years ago, receiving his training in finish touch-up and repairs from his friend and fellow Estonian, Tynis Promet. Now the owner of his own business, Arno is frequently (and sometimes frantically) called upon to bring his formidable skills to bear against the multitude of blemishes that can befall a piano case. With two enormous, wheeled toolboxes, Arno arrives for every service call fully armed with steel wool and sandpaper for rubbing out fingerprints, a buffing wheel for eliminating scratches and restoring luster to polish finishes, and a blowtorch for heating what looks to be an industrial spatula used to spread lacquer and polyester fills for dents, chips, cracks and gouges. He even owns the what appears to be the world’s smallest dremel to better better control the size and shape of a section that needs to be filled. 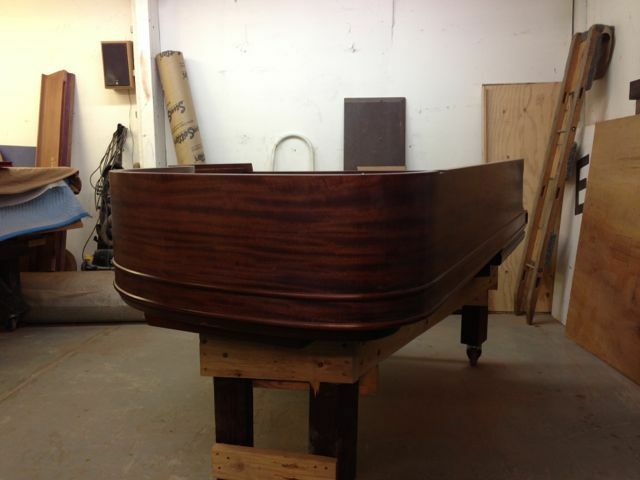 The end result of all of Arno’s drilling and sanding and filling and polishing and the mixing of colors to match the tone of the piano (according to Arno, black, rather than walnut, mahogany or any other wood tone, is the hardest color to match, since every piano manufacturer’s shade of black is slightly different and therefore needs the most subtle of mixing) is a piano that looks like it was never blemished at all, even under the most intense scrutiny with a bright flashlight. 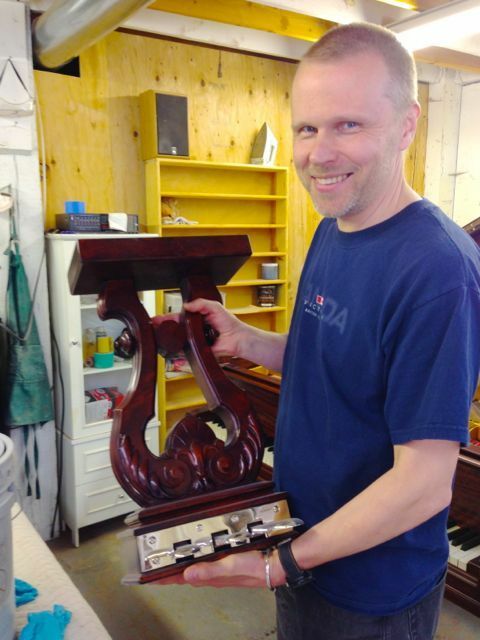 Additionally, for those finishes that are too far gone due to the sun, pet claws, curious children, too many dings from numerous moves, or just weren’t that attractive to begin with, Arno also refinishes entire pianos out of his shop in SE Portland. With the help of his son Marpa, who began apprenticing under his dad about 5 years ago, Arno begins by removing the original finish (with environmentally friendly soy-based paint stripper, of course) and meticulously sands every crevice of every piece of the case down to the veneer. Arno then painstakingly stains, tones and builds up the finish, layer by thin layer. In between the application of each coat, he must wait for the previous layer to dry and then smooth out any irregularities. 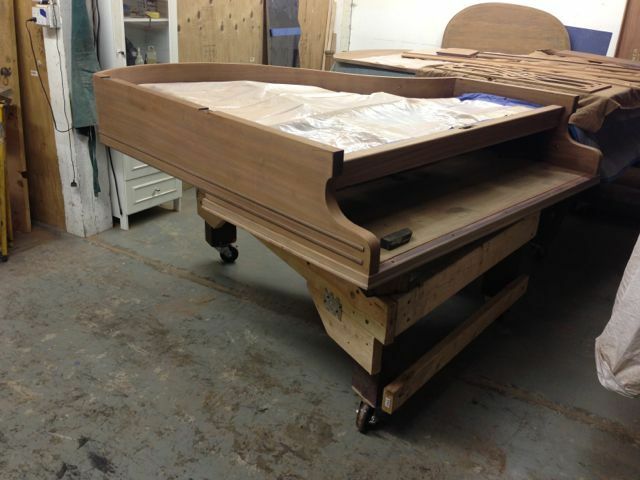 At the end of the process, there are approximately fifteen layers of finish on the piano. And when Arno is finished (ha! ), the case is immaculate and the piano looks like new. Full Disclosure: Arno and I are both friends and work colleagues, and occasionally collaborate on projects together. Dark wood-toned pianos, such as mahogany and rosewood, tend to be my favorite piano finishes, so I was thrilled upon a recent visit to Arno’s shop to see that the yellowish finish on the Steinway grand pictured in the original text of the post had been transformed to a beautiful, rich, deep red mahogany with scintillating golden highlights. And when I say scintillating, I am not in the least bit exaggerating. I have never seen a finish shimmer and change depending on the light the way I did on this finished lid. I was especailly impressed with the finish of the upper legs, for which Arno actually had to create a grain that would match the rest of the piano. Additionally, the detail required to refinish all of the nooks and crannies of the intricate lyre (the pedal system) must have been incredibly painstaking as well as time consuming. If you weren’t convinced by Arno’s refinishing prowess before, what do you say now?